The Computational Fluid Dynamic and Flight Mechanics Group is a leader among research centers in Poland in the area of aerodynamic design and CFD analysis. Our staff comprises highly qualified engineers specializing in CFD as well as airframe design and optimization. For research and development work, both commercial and in-house developed software is employed according to the scope of work and its specification. design of Experiment (DoE) methodology. design of parametric models for nonaviation applications and CAD design. For computational analysis of flowfield, both commercial and in-house developed software is employed. In collaboration with other research facilities, our group takes part in developing new software for academic purposes. EADS-CASA aerodynamic Study of A400M Air-intake. Warsaw Technical University 1. 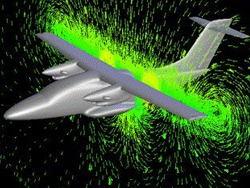 High Efficient 3D CFD Codes for Industrial Application High Reynolds Number Tools and Techniques For Civil Transport Aircraft. 2. Design Modeling and Design of Advanced Wing Tip Devices 3. New Aircraft Concepts Research Computational method for determining flow around main rotor blades. Institute of Turbomachinery Developing and implementing new generation design, technology, and material solutions for the main rotor and airframe elements of the PZL W-3A Sokol helicopter. PZL-Świdnik S.A. Developing and implementing the generation design, technology, and material solutions for the main rotor and airframe elements of the PZL W-3A Sokol helicopter, 2007-2011. AEROFAST: Aerocapture for Future Space Transportation, Project KE 218797, 2009-2011. Janusz Sznajder, Ph. D. Eng.